Nickname: Joe. 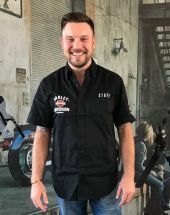 Hobbies: Harley® and H-D®. 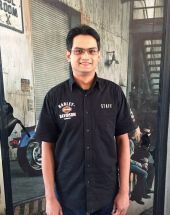 Favourite Harley®: The ones parked in my garage. Age: Old enough to realise I’m learning from my mistakes. Words to live by: Fortune favours the brave. Nickname: Ant. Hobbies: Riding, and riding some more. Favourite Harley®: Road Glide® Special. Age: 34. Words to live by: What a time to be alive! Nickname: Sparkles/ Noels Hobbies: Painting and camping. Favourite Harley®: 1200 Sportser®. Age: 62. Words to live by: Do it now! Nickname: Iron Maiden. Hobbies: Reading and crafting. Favourite Harley®: Heritage Softail® Classic. Age: Old enough... Words to live by: Carpe Diem! Nickname: Ang, Angie. Hobbies: Cooking and gardening. Favourite Harley®: Breakout®. Age: It's just a number... Words to live by: Be the change you want to see in the world. 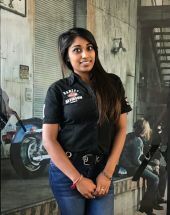 Nickname: Tren Hobbies: Reading and going on adventures Favourite Harley® motorcycle: Street Glide® Age: 21 Words to live by: "Life is 10% what you experience and 90% how you respond to it". 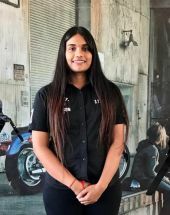 Nickname: Nish Hobbies: Volleyball Favourite Harley® motorcycle: Softail® Deluxe Age: Forever young Words to live by: "I do it because I can, I can because I want to, I want to because you said I couldn't". 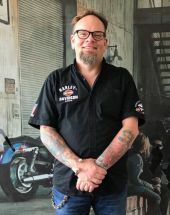 Nickname : Ky Favourite Harley® motorcycle: Road King® Special Hobbies: Surfing, Drumming and riding motorcycles . Age: 27 Words to live By: Don’t deny the past you leave, don’t neglect the future you have. 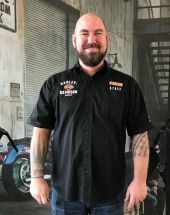 Nickname: Matt Hobbies: Bikes, Bikes, Bikes & Rugby Fav HD: CVO™ Pro Street Breakout Age: 33 Words to live by: "Life is short, smile while you still have teeth"! Nickname: Cat. Hobbies: Fishing and motor sport. Favourite Harley®: Breakout®. Age: 35. Words to live by: Better to try than fail to try. 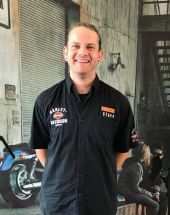 Nickname: Rhys Hobbies: Cricket, Airsoft, Fishing Favourite Harley® motorcycle: CVO™ Pro Street Breakout® Age: Avoiding 40 Words to live by: "Don't look back, you're not going that way." Nickname: Mdocy. Hobbies: Pantsula dancing and soccer. Favourite Harley®: V-Rod®. Age: 43. Words to live by: "Respect". Nickname: Jase. Hobbies: Gym and riding motorcycles. Favourite Harley®: Sportster® XR1200X Age: 27. Words to live by: Loyalty and respect. Nickname: Skaff. Hobbies: Food and gym. Favourite Harley®: Street Glide®. Age: 33. Words to live by: Built to rock, ready to roll! Nickname: Jay. Hobbies: DIY enthusiast, cooking. Favourite Harley®: Street Glide®. Age: 44. Words to live by: Respect one another. Nickname: Naughty Boy. Hobbies: Soccer and riding bikes. Favourite Harley®: Street Glide®. Age: 30. Words to live by: Ride it like you stole it! Nickname: Sunny Boy. Hobbies: Soccer. Favourite Harley®: Breakout®. Age: 27. Words to live by: Enjoy life like there's no tomorrow. Nickname: Ma. Hobbies: Gardening. Favourite Harley®: Trike. Age: 41. Words to live by: Be happy!